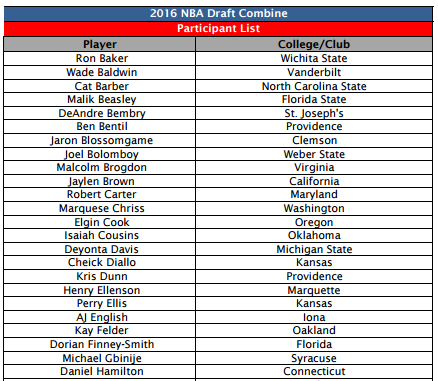 The NBA released the full list of college players who will participate in the upcoming draft combine on Thursday. The NBA has released the full list of college players who will participate in the upcoming draft combine. Not among the players who will be attending is possible No. 1 pick Ben Simmons of LSU. Simmons declining the invitation to the combine does not come as a complete surprise, as top players have had a habit of skipping the combine in recent years. The other big name player who will pass on the combine in Washington’s Dejounte Murray, who was named Pac-12 All-Conference second team after averaging 16.1 points and 6.0 rebounds as a freshman. The combine will be held from May 11–15.